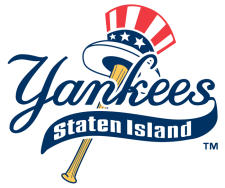 I made my way to race central, which was the Richmond County Ballpark, home of the Staten Island YANKEES. Yes, I kid you not. You read that right. Check out their logo. Needless to say, their uniforms looked a little familiar too. But I refused to allow the creeping frown to cross my face because I was feeling good about SI and SI was feeling good about me. Also the stadium start meant that we had the honor of using real bathrooms. No porta potties today!!! And things just kept getting better. A bathroom angel tipped a few of us off that there were empty restrooms on the upper level of the stadium. So I managed to avoid standing on the obscene line that had formed. When I returned downstairs an announcement was made that the corrals were closing and for the first time that I can recall, I saw a super long line to the men’s room. I paid it forward and told some gentlemen about the upstairs restroom. Only one guy went to check it out. Oh well, more bathroom for him. The corrals were located in the back of the stadium, right on the water with an incredible view of the Manhattan skyline. 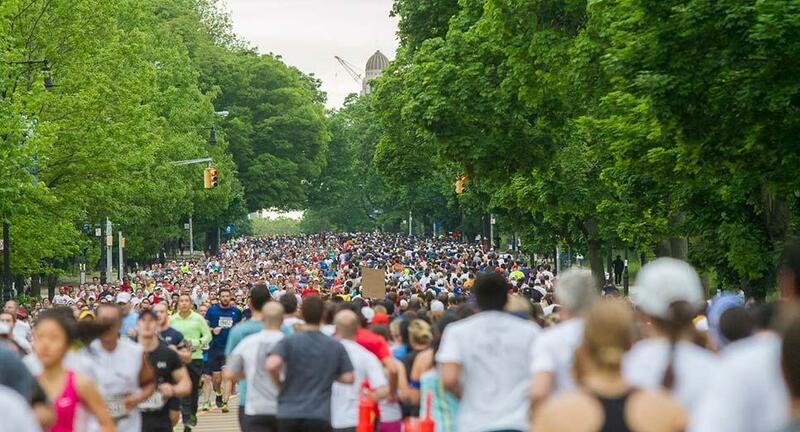 With almost 9000 runners, it took a while after the gun went off for my corral to make it to the start line. But we were off soon enough with Michael Jackson’s Thriller blaring. I felt good. The weather was perfect. There was a small hill at the corner of the stadium. No sweat. I was feeling the love. 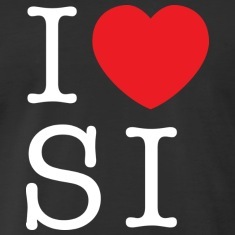 I heart SI. Then there was another hill. Hmmm, I’m feeling like Staten Island has reached its hill quota. Next thing I know, I’m around mile 3 and I see a homeless man running across the course yelling. So I’m wondering what is all this commotion? 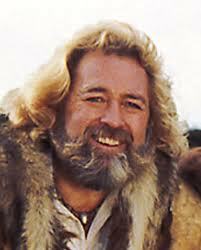 Wait a minute, Grizzly Adams is wearing a race bib. As I get closer to him I hear him screaming, “Not another hill, who said that this was a flat course?” I look up and see a steep hill. I figure this is not the time to freak out, so I pass insane Grizzly and will him to zip his mouth. Then I put my head down and kept it moving up the hill. So we’re moving right along, I’m keeping a decent pace and it is actually feeling quite warm out. I was fine with that because I wore a t-shirt … my favorite BGR shirt. But now we are entering a tunnel and I gotta tell ya, that thing reeked to high heavens. I was getting animal poop from it but by the time we were exiting it started to have a human touch. I started looking around at the runners for evidence but could find none. Now somewhere around here, I don’t recall whether it was before or after the tunnel, there was a noteworthy hill. The payoff on this hill was pretty sweet thought because what went up, certainly came down. I had the pleasure of enjoying the nicest downhill run ever. I looked at my watch and it told me I was going WAY too fast but my legs were moving themselves, so I went with the flow. Shortly after, the 2:10 pacer passed me. I was a little confused as to how I got in front of the 2:10 group but decided to keep them in my sight. I was doing well with that until I stopped for Gatorade and water just before mile 7. By the time I got going again the pace group was nowhere in sight. I hit the out and back turnaround point at mile 7 and felt a little relieved because I had no idea whether I had been going too fast in the first half of the race. Since I was feeling good, I felt comfortable speeding up a little with less than halfway to go. 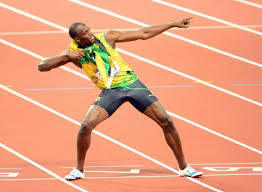 The international symbol for fast runner and I was feeling speedy. Now I am shaking and baking, moving and grooving. I take the next couple of miles like a champ. But of course it was too good to be true because at mile 9 there stood in front of me a massive hill. I had just run right past a hydration station and was wondering if I should go back for fuel to get me over this here mountain. 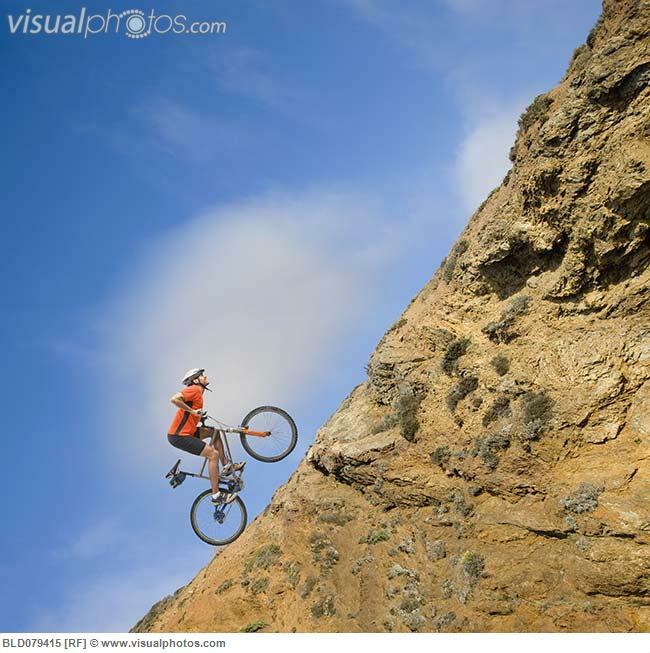 I realized how crazy that would be so I plugged on … and on … and on … and on up this hill. At some point I realized that this was the other side of the fabulous downhill that I had enjoyed earlier. That’s when SI got the side eye. The disdain was creeping back. I told myself to remain positive. If I love SI, SI will love me. I made it over the hill and to mile 10. All I had left was a 5K. I could do that!!! Okay, so this is not the hill but it might as well have been. I was back to moving and grooving. At mile 12 I started to feel a little tired but there were some lively spectators close to the marker. Thank you mile 12 cheerers. I waved at them and took some of their energy. Before I knew it I was turning the corner to the stadium and suddenly turned bionic. I could hear the bionic man music. I ran like the wind into the stadium and down the home stretch. I didn’t even care that I was running on grass. I usually hate grass, even the fake variety. A male spectator yelled, “Go BGR!! !” I smiled and rushed the finish for a new PR. Didn’t you just love it when Steve Austin and Jaime Sommers would team up? Woohoo!!! I felt good. Mostly because I could tell that the marathon training is paying off. Also, I felt physically stronger than I usually do at the end of a Half. I wasn’t hobbling or cranky and that was great. I was feeling pretty good about hilly Staten Island. Then I got in my car, made a left out of the parking lot and lost all that loving feeling. It took me about 45 minutes to drive 3 blocks. We almost made it SI, we almost made it. Less than three weeks to the marathon. Stay tuned. It’s been a long time since I have posted. I have run a few good races since my last post. 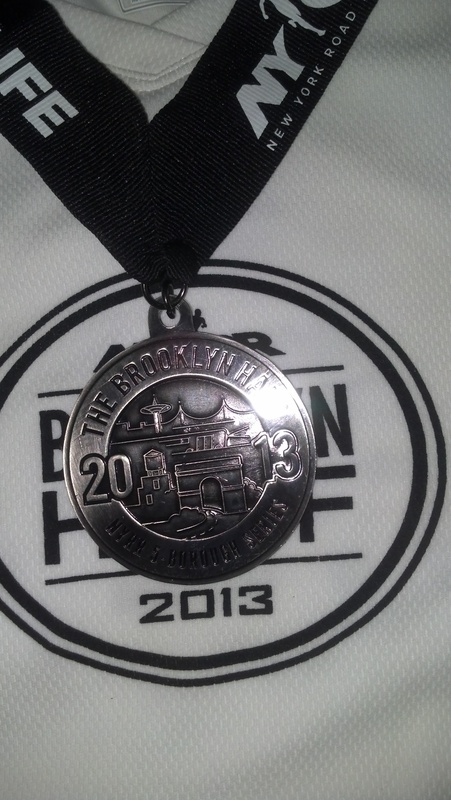 Last month I did the Rock n Roll Brooklyn 10K but I will admit that my running has fallen by the wayside a little. 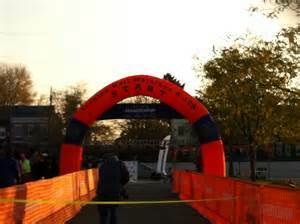 Now, today marked the second year of the Trenton Double Cross Half Marathon. 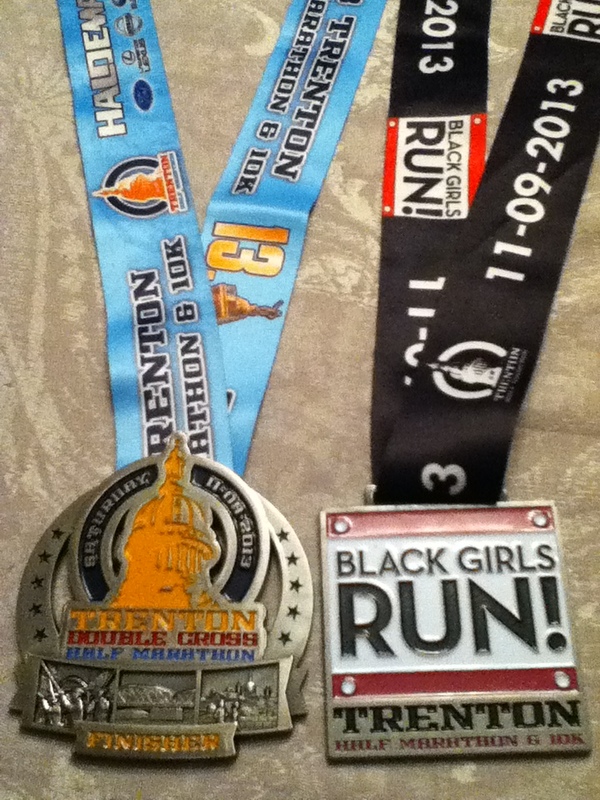 I had been looking forward to this race for a long time as it was recommended by Black Girls Run (BGR) AND because BGR was providing a special finisher medal to its members. 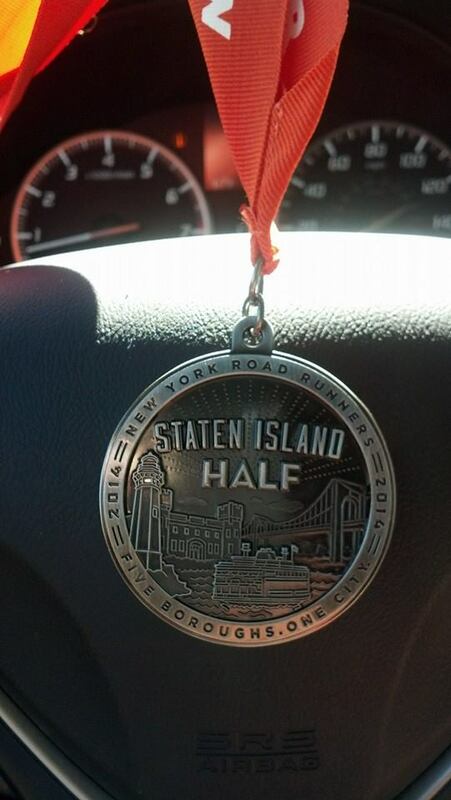 So this race was a bona fide twofer bling fest. However, my training was hampered by my busy schedule and my last couple of runs did not look too promising. But I was determine to see this one through. In addition to my running woes, there were a few things that gave me pause about how the race was going to go. First I realized late in the game that there was an actual host hotel that I was not staying in. I did seek out that information on the race website prior to booking a room at the Comfort Inn in Morrisville, PA. Apparently, the race coordinators added this information later. So my travel buddy and I wound up having to drive over to the host hotel to catch the shuttle bus to the race. 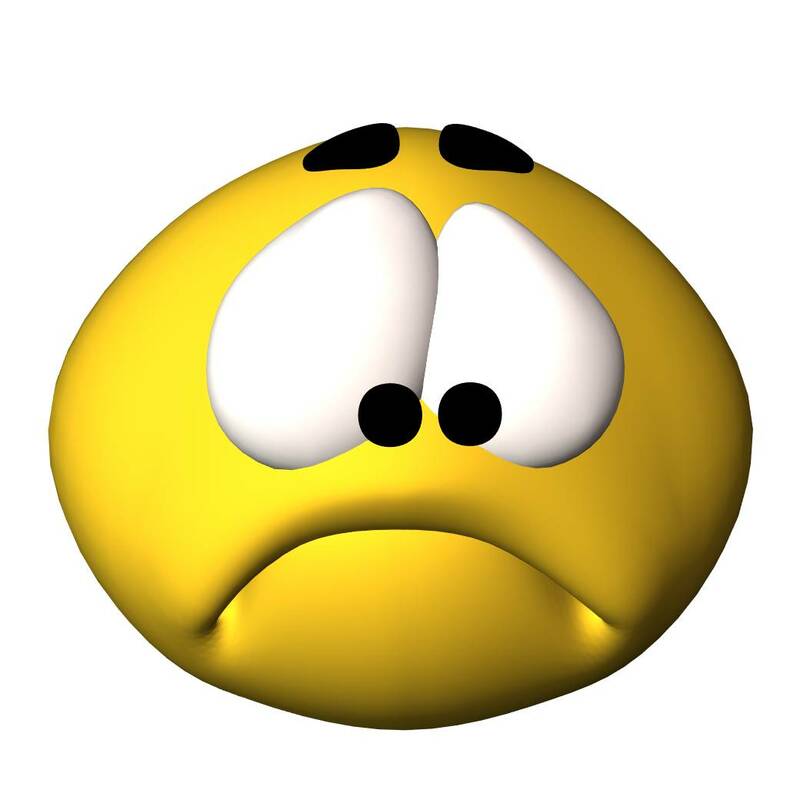 Then after arriving a the hotel, I realized that I had left my watch at the Comfort Inn. Yikes. I NEVER run any race without my Garmin, much less a half marathon. I was completely freaked out and annoyed because if I was staying at the host hotel I would be able to retrieve my watch by just jumping on an elevator. The third problem was the shuttle buses, they seemed to have just one shuttle bus to take runners to the race location. This cause a little tension because there were hundreds of runners trying to get on one yellow school bus. And finally, I brought my “stomach medicine” to race and then forgot to take it. There will be no further exploration of that topic. Anyway, we got to the race and lined up. It was freezing … well, almost. It was 33 degrees. As I was positioning myself at the start, I saw the five year old boy that was going to be running the half marathon. He had been getting a lot of press as he would be the youngest person to complete a Half. I was genuinely excited for the lad but not thrilled at the thought of being bested by a five year old. I moved further down in the starting chute and was happy to not have to look at boy wonder anymore. The anthem was sung by a Tony Bennett-esque man. He did a good job and then we were off. I was obsessing about starting too fast because I had no idea what my pace was. Early in the race I ran into Lisa from my BGR group and we ran together for about six or seven miles. She lives by the watch too and helped me with my pace. Also, I didn’t see a bunch of mile markers and had no idea how far we had run. When I finally asked Lisa what mile we were at in race, she said, “Five.” FIVE???? FIVE measly miles!!!! I was hoping she was going to say Eight. At that point we had passed many water stations and I figured were further along. Kudos to Trenton, I have never been so hydrated in my entire life. Alright, that’s not really me. Now, if you are wondering why the race is called “double cross” it’s because the race starts in Trenton at the Arm and Hammer Stadium and then crosses (by bridge) into Morrisville, Pennsylvania and then it goes back to Trenton (by another bridge). The bridges were a little tough because the surfaces are uneven metal grates. 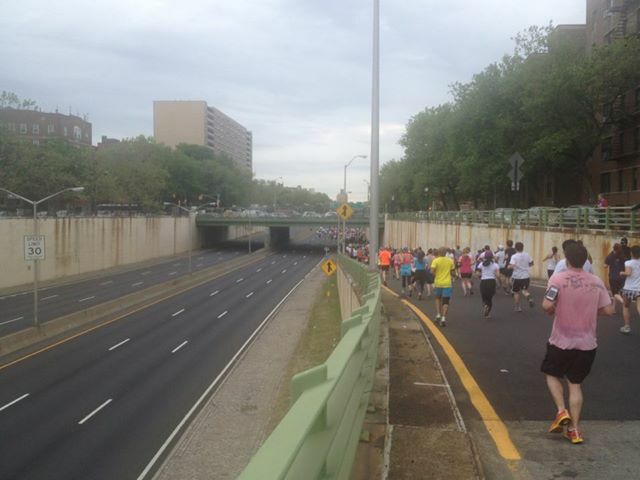 By the time we got to the second bridge, most of the runners (including me) opted to run on the paved pedestrian walkway. Things were moving right along until mile 8, when I saw him. That five year old whizzed right past me at the water station. I had a near melt down. Lisa had to near slap me back into reality. I continued to run but was starting to feel really sluggish. It didn’t help that we entered a park with a brutal hill. At this point I knew I couldn’t keep up with Lisa and just slowed it down a little. At mile 9 I gained my second wind. Oh yeah, I felt like I was really moving but I didn’t know for sure without my watch. I was right behind the little tyke. He looked so cute and strong. He was holding a woman’s hand (maybe his mother) and was doing his thing. I noticed that they didn’t seem to stop at the water stations. The woman had a hydration belt and they were most likely self fueling. I felt a little bad for trying to compete against a small child … BUT NOT THAT BAD!!! See yah kiddo. I passed him at around mile 9.5. My second wind left me at around mile 12. Which was the last mile marker on the course. This drove me near crazy because I had no idea how close I was to the finish. At one point, right at the stadium parking lot, the spectators were lined up and cheering. Believing I was right around the corner from the finish line, I sped up and began high fiving all the spectators. BRING ON MY MEDALS!!! I turned the corner and think I really heard a needle scratch a record. THERE WAS NO FINISH IN SIGHT. Disappointment does not begin to describe my feeling at that moment. Eventually I entered the actual stadium. There were tons of spectators there and high energy but I still couldn’t see the finish line. When I finally saw it, I was so excited but couldn’t muster up a sprint to the finish. Other runners were flying by me but I didn’t even care. I trotted on through that finish line. The announcer proclaimed my finish. This was a really nice touch as this was a large race but they still managed to announce everyone as they crossed the finish line. As I was looking at the stadium steps that I was going to have to walk up after running 13 miles, the crowd erupted. 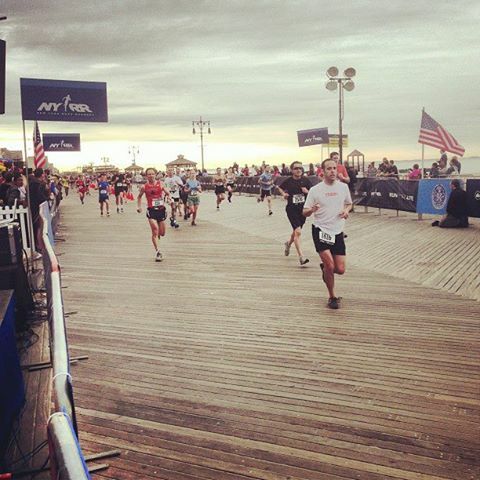 Five year old Anthony Russo had just crossed the finish line as the youngest person to complete a Half Marathon. AMAZING. And here’s the kicker, he beat me. When I checked the race results, his time was around a minute faster than my 2:23:11. Apparently, I crossed the start line way ahead of him. GOOD FOR ANTHONY!!! This was a good race and I wouldn’t mind doing it again. I feel it will just get better since it’s only in its second year. I have to give a special shout out to the Comfort Inn in Morrisville because they were really cool about extending our checkout time so we could get ourselves together before hitting the road. Also, Andrea, my partner in crime on this running mission, gets a shout out for rubbing and stretching legs after they both cramped up as I unsuccessfully tried to get out of the car after driving back to New York. She endured my screams of pain really well. With that said … WHEN’S THE NEXT RACE!? !